Tuesday 25th September 2018 6.30 pm - late JuJu's Bar & Stage 15 Hanbury St, E1 6QR No registration is necessary. Free entry. 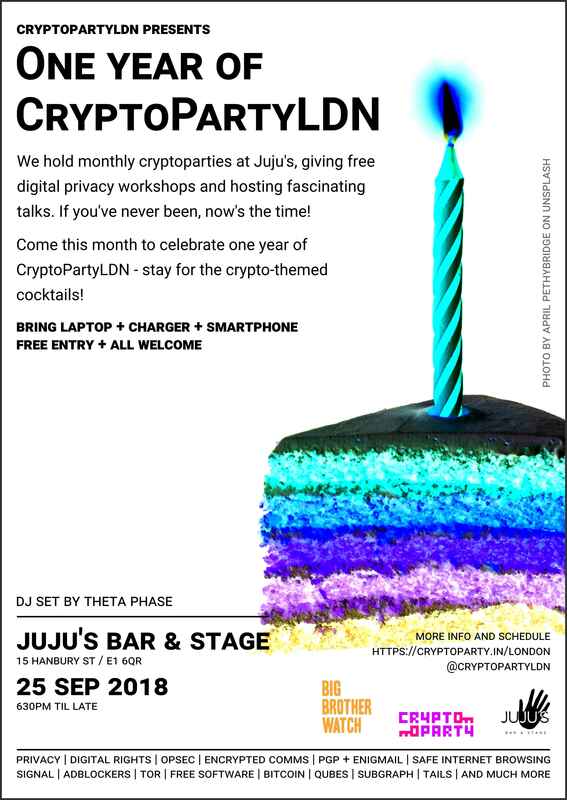 September CryptoParty Address (Silkie & Fabio) + CryptoParty Themed Cocktails + drinks. @SpyBlog Compartmentalising = a piece of cake How to threat model, and keep your personal life / normal work / confidential contacts or sources, separate from each other using low tech and high tech. Also the regular Anonymity SwapShop - bring along spare social media accounts, SIM Cards, burner phones, Oyster Travel Cards etc. to swap or barter with other people, to help break the financial and CCTV purchase trails. @leotanczt It's my party, I'll encrypt if I want to How to install VeraCrypt, a digital strongbox for your files, and how to protect your files with encrypted and hidden storage. @gouttegd PGP Party Want to communicate securely? Learn here how to use simple encrypted comms tools like Signal for messaging, voice and video calls, and small file sharing; plus why and how to use more challenging PGP email encryption. @SarahAzouvi Happy Browsing x Anonymity and safety online: how and when to use open source browsers, privacy plug-ins, and the Tor Browser. Phil Booth @EinsteinsAttic NO2ID, and NO to care.data Phil Booth takes us on a whistlestop tour of successful campaigns against the database state. Phil led NO2ID, the UK-wide campaign against the database state, from 2004 to 2011, playing a key role in successfully dismantling the Home Office ID scheme and the repeal of the Identity Cards Act 2006. Phil is now the coordinator of medConfidential, which campaigns for confidentiality and consent in health and social care - and has a successful campaign against the care.data centralised patient data scheme under his belt too. Phil runs TRUTH2POWER which provides practical and strategic advice and skills training to campaigners/campaigning organisations. Phil’s work as an advocate has been recognised by awards from Privacy International (2008) and Liberty (2010).